Durham, N.C.-based Percona continues to challenge Oracle directly with an update of its own MySQL distribution, one focused on high-performance. Percona Server for MySQL 5.7 offers all the improvements found in Oracle’s MySQL 5.7 Community Edition as well as its own enterprise features aimed at greater visibility, performance and security. Those features include its newly-acquired write-optimized storage engine, TokuDB, touted as the only transactional storage engine for MySQL. It’s also offering for free features found in Oracle’s commercial MySQL Enterprise Edition including external authentication, audit logging, and thread pool scalability to 10,000+ connections per server. The company also released Percona XtraBackup 2.4, an open source online backup solution offered free for all versions of Percona Server, MySQLand MariaDB. It provides encryption, speed, uninterrupted transaction processing and non-blocking, real-time backups that are tightly compressed. MySQL continues to be the longtime No. 2 most popular relational database system behind Oracle’s own flagship eponymous database system. With previous versions of MySQL, Zaitsev explained to The New Stack at that time, throughput was limited due to the fact that all processing was handled by a single thread, running on a single core. Now MySQL can run across multiple cores in parallel. Since the acquisition, Percona integrating the capabilities into its own products, Zaitsev said. Zaitsev managed the High Performance Group within MySQL AB, its Swedish founding company, and Tkachenko was performance engineer there until they formed Percona. Schwartz went on to form database monitoring service VividCortex. Sun Microsystems bought MySQL AB in 2008, and Oracle acquired Sun in 2010, leading to much debate – and even a petition to stop the acquisition – over whether there would be an open source future for MySQL. With the Oracle buyout of Sun, original co-creator Michael “Monty” Widenius forked MySQL, launching MariaDB. “A lot of people really like Oracle in terms of engineering, but they don’t like how hard it is to support open source technology” — Peter Zaitsev, Percona CEO. Gartner included traditional relational database management systems (RDBMS), NoSQL, and in-memory databases in its Magic Quadrant report released in October, indicating a convergence in the industry. It ranked Microsoft ahead of Oracle among the leaders as well as Amazon Web Services, a new entrant to the category. Percona and MariaDB were ranked as “challengers.” Gartner lauded Percona for its commitment to open source software – Percona contributes all its innovations to the community versions of MySQL and MongoDB — reported customer satisfaction and value. However, raised questions about Percona’s competitive differentiation and limited focus on emerging market influences such as analytics and IoT. Zaitsev says the company has a “broad take” on the technology it supports. “We have a lot of customers running MySQL or MariaDB or Amazon RDS services in addition to Percona Server and Persona XtraDB Cluster. We are not a single technology company; we are a solution company, bringing the best solution to our customers,” he said. As for analytics and IoT, he said. “Open source offers a lot of technologies out there. We’re not trying to be the solution for every problem. Earlier this month, Percona released experimental images for Docker running on Percona Server MySQL (version 5.6) and Percona Server for MongoDB, and Tkachenko has been blogging about CPI/network overhead and Docker overhead using those images. It’s working on images for MySQL 5.7 and still in the evaluation of Docker and other container formats. Amazon also this week announced RDS support for MySQL 5.7. 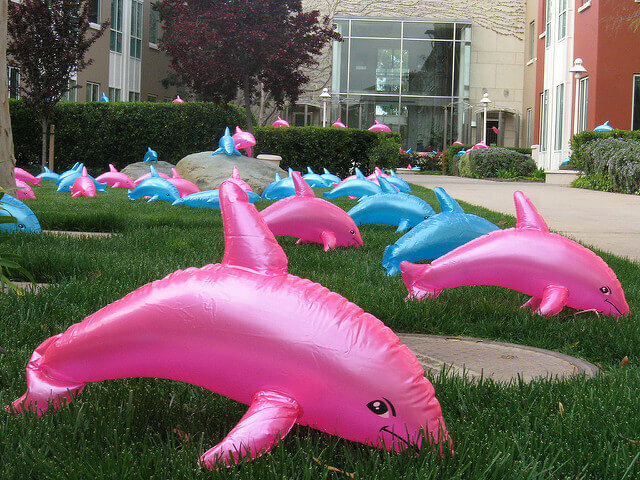 Feature Image: “Blue and pink dolphins at work this A.M.” by Richard Masoner, licensed under CC BY-SA 2.0.